Starting a new diet can be difficult, learning about one shouldn’t be. 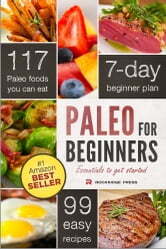 Paleo for Beginners: Essentials to Get Started, is a comprehensive, yet concise guide to embracing the Paleo lifestyle. John Chatham, bestselling author of The Paleo Diet Solution and The Paleo Diet Solution Cookbook, walks readers through every step of success in a concise, easy-to-read format. Extensively researched, Paleo for Beginners offers answers to your most pressing Paleo questions, from the basic to the more scientific. No, in fact it is the diet humans were designed to eat. Also known as the Primal diet, the Caveman diet and the Stone Age diet, the Paleo diet has literally been around as long as men and women have roamed the earth. The low-carb, high-protein diet is a simple, healthy way to lose weight and feel better. Enjoy the best health of your life, and lose weight while preventing and treating diabetes, hypertension, heart disease, cancer, osteoporosis, and many other modern illnesses. Is the Paleo diet healthy or will I have to starve in order to lose weight? The Paleo diet focuses on weight loss and muscle tone through healthy eating and full-sized portions. Calorie counting, starvation, or unhealthy changes to your diet are not a part of the Paleo lifestyle. The Paleo diet avoids processed foods that can be difficult for the body digest and contain unhealthy chemicals and additives. The only diet that helps you to lose weight while enjoying full, healthy meals, the Paleo diet has been proven by the medical community to help treat and prevent many of our modern health maladies. Why postpone losing weight, feeling healthy and increasing energy one more day? The 7-day step-by-step preparation plan puts you on a path to successfully make the transition to the Paleo lifestyle. Set yourself up for success with the grocery shopping guide and a list of 117 Paleo-recommended foods (and a comprehensive list of what food items you should avoid). 99 healthy recipes offer meal ideas for breakfast, lunch, dinner, dessert, and the snacks in between. Grain-free alternatives to your favorite foods include Eggs Benedict Paleo Style, High-Protein Grain-Free Burgers, Chicken Avocado Wraps and Paleo Waffles. 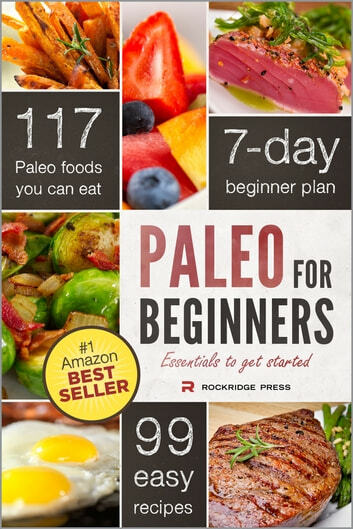 Paleo for Beginners offers everything you need to know to get started on the Paleo diet today. Fabulous loved it. Easy to follow and understand. Great recipes. I will definitely be returning to this book for inspiration and ideas.